Portable Restrooms Sales & Installation Nationwide. One of the most important things that you need to consider when planning your business premises is the quality and number of restrooms that you offer for your staff. It is essential that enough facilities are available, as this is a requirement for your business. One problem that a lot of companies have run into in recent years is that they have made increases to their work forces, and not had the infrastructure in place to support additional staff numbers. This has led to having to invest in building additional services into their business premises. Adding conventional toilets can be extremely time consuming, not to mention expensive, and the best solution for many businesses is to choose portable restrooms, which can be supplied almost complete and simply plumbed into the mains water supply, and used immediately. One of the main expenses that businesses face when installing bathrooms using conventional building techniques is that they require a large number of different tradesmen to carry out the tasks including builders, plumbers, and specialist tillers as well. The fact that so many different people need to be involved in the construction process has a predictably inflationary affect on the overall cost of the project, and also can lead to delays due to the availability of staff at key parts of the job. This is an entirely different experience than you have with the relatively simple and quick installation of portable restrooms. Because portable restrooms are made using prefabricated modular construction techniques, they can be delivered to the site with a minimum of construction work remaining. In most cases, the portable restroom unit can be simply unloaded from the back of the truck, put into place and connected to the power and water supplies, and it is then ready to use. Because our portable restrooms feature the use of high quality components such as 3” thick walls, standard bathroom furniture and interiors are of a very good standard. 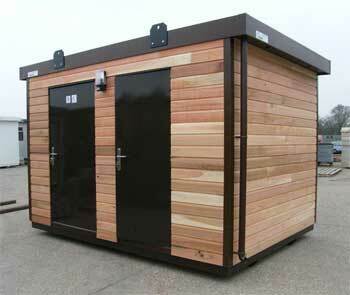 Unlike some temporary structures that seem relatively low quality and insubstantial, these units, which can be assembled in a matter of hours are of a comparable standard to a professionally installed bathroom built using conventional means. By choosing the colors and décor to match the rest of your building, and locating the portable restroom close to the staff who need it most, you will be improving the workplace. This will have a major impact on the quality of life of all staff, and make sure that staff are looked after. It will also mean that any bathroom visits are likely to be shorter, as there will no longer be any need for queuing, and this will have a slight impact on the actual amounts of productive time that staff are able to spend at their workstations. Thanks to the high quality of the portable restrooms available from Easy Rack, you are getting a premium product that has many business benefits such as quick installation, easy maintenance, and great flexibility at a fraction of the price that you might have expected. Easy Rack carries a wide variety of commercial shelving, material handling equipment, used pallet racks, and modular prefab buildings installed nationwide. If you can not find what you are looking for call us toll free at 1-888-776-3720 and we will find it for you. Our home office is located in Houston, Texas with warehouses located throughout the United States that enable us to service all 50 states.